R.A. White & Co. plaques are manufactured to the highest standards combining ageless principles of metal moulding with modern technology. Patterns for the plaques are either traditionally hand made or produced using high tech modern materials by photographic type processes from computer generated typesetting and graphic designs. Moulds are made from these patterns in special sand to give very precise detail. The bronze is heated in the furnace until molten at over 1200 degrees C, is then hand poured into these moulds to produce a bronze casting. These castings produced are then carefully fettled and ground and specially treated to produce a contrasting dark bronze background to the bright finely finished raised lettering, borders and other detail. 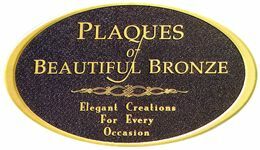 The entire plaque is then clear coated to provide a long lasting weather resistant finish. Plaques can be finished in enamel colours and may also be cast in aluminium.